HUMANITY DELETE is another band from Rogga Johansson where he does everything by himself. Good job, dude, you have way too much time on your hands. If I were to describe this album in one sentence it would be the following. 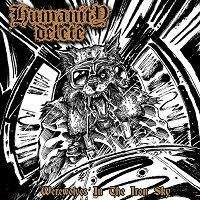 “Werewolves in the Iron Sky” is a collection of mid-paced, basic Deathgrind that fails to inspire or impress. Everything with this album is basic, predictable and by-the-books. To give perspective as to how this album goes, everything sounds like one song, but each time I look at my phone, a different track is playing. The riffs on this album are, again, basic. The melodies are so dull and tamed that they might as well not exist. The solos are all the same: a blistering cluster of notes that does nothing other than prove that the guy can play a blistering cluster of notes. The music is all played at the same – or at least very similar – mid-paced tempo. Each song is like this. Take (closes eyes and randomly points) “Prototype Metal Claw” for example. Imagine the most basic riff structures you can think of and throw a few of them together. Boom, you have this song. To top it all off, the solo is so irrelevant and identical to the others before it that I almost didn’t hear it. This album hits rock bottom once “Conjure the Moon” happens. On one hand, this song has really nice depth, but on the other hand, the riffs and melodies are the worst on the album. The main riffs are both very melodic, but they aren’t good melodies. I swear there are some riffs that need to be copyrighted because they’re so overused. Then maybe this song wouldn’t have fallen victim to so many abused riffs and tasteless melodies. There are only two songs on this album that I can honestly say are good. The first one is “Lunar Rites”. This track is doomy and gritty enough to be enjoyable. Unfortunately, the production is the worst on this song, having this very annoying pluck in the chorus at the top of the main riff, but I can ignore that. Otherwise, the riffs are cool and the song structure is the best this album has to offer. The second song is “Werewolf Reich II”. This is the instrumental outro. It has nice acoustics that make it stand out from the rest of the album. Overall, it serves its purpose as an outro very well. This album is definitely nothing special. It’s boring and hard to sit through despite its short time. I feel like I’m listening to a compilation of every riff that every Swedish Death Metal band decided not to use, and that, as you can imagine, is not a good thing.